By June 1934, the SA, led by longtime Hitler friend and SA Chief of Staff Ernst Röhm, had expanded to a force of nearly three million men, significantly outnumbering the German Army. The SA leadership sought to remove political elites from power and replace them with fanatical Nazis. This became a source of embarrassment and discomfort for Hitler in his dealings with conservative nationalist politicians, including President Paul von Hindenburg and Vice-Chancellor Franz von Papen, who feared that the SA had become too powerful. The ambition of SA leaders to replace the German army officer corps and the professional army with a “People's Army” became a threat to the Nazi regime itself, as Army leaders responded by demanding the elimination of the SA as a condition for permitting the Nazi government to remain in power. Knowing he would need support from German army commanders to become President, Hitler tasked Heinrich Himmler and the SS with carrying out a violent purge of the SA. On June 28, Hitler ordered Röhm to assemble the top SA leaders at a Bavarian spa in Bad Wiessee. SS units, commanded by Dachau concentration camp commandant Theodor Eicke, surprised the SA leaders on the morning of June 30 and transported them to Munich's Stadelheim prison. There SS men shot most of the prisoners. Hitler remained indecisive about Röhm's fate until July 1. On that day, at the Nazi dictator's expressed order, Eicke and an adjutant shot Röhm in his cell in Stadelheim. The SS murdered the top SA leaders both in Munich and around the country. It also took the opportunity to eliminate several other political opponents, mostly right-wing nationalists, as well as former supporters whom they believed to have betrayed the Nazi movement. These included Reichswehr General Kurt von Schleicher, Hitler's predecessor as Reich Chancellor, and his wife; and Gregor Strasser, a former Nazi leader. In all, it is estimated that between 150 and 200 people were killed in the purge. The police took more than 1,100 persons into protective custody, including many SA officers. On July 3, the Reich Cabinet issued a law, legalizing the murders after the fact as an emergency action to save the nation. 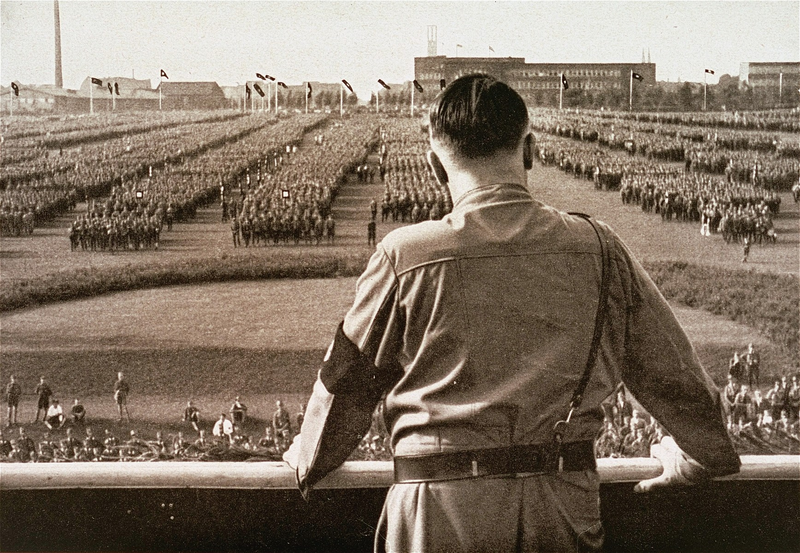 Hitler addressed the Reichstag on July 13, where he similarly justified the action and falsely accused Röhm and his commanders of planning to overthrow the government. The purge demonstrated the Nazi regime's willingness to go outside the law to commit murder as an act of state for the perceived survival of the nation. With support from the German Army secured, and the death of President Paul von Hindenberg imminent, Hitler made his bid for absolute power, proclaiming himself Führer and Reich Chancellor of National Socialist Germany on August 1, 1934. July 1-13, 1934 Editorials, opinion pieces, letters-to-the-editor, and political cartoons regarding the "Night of the Long Knives"
July 14-20, 1934 News articles, editorials, opinion pieces, letters-to-the-editor, and political cartoons about Hitler's address to the Reichstag justifying his purge of the SA. In some cases, Hitler's speech was even reprinted in US newspapers. August 1-15, 1934 News articles regarding Hitler proclaiming himself absolute dictator of Germany. July 27-29, 1934 News articles, editorials, opinion pieces, letters-to-the-editor, and political cartoons about rising tensions between storm troopers (SA) and the German military which contributed to Hitler's decision to purge the SA.